Dr. Lisa Gavin received her doctorate degree in Audiology from the University of South Florida and her Bachelor of Arts degree in Communication Sciences and Disorders from the University of Florida. She completed her clinical residency at the Washington University in St. Louis Adult Cochlear Implant and Aural Rehabilitation Program. Dr. Gavin is trained in the areas of comprehensive audiological evaluations, advanced hearing aid technology, bone-anchored hearing aids, auditory brainstem response, vestibular evoked myogenic potentials, electrocochleography, videonystagmography, and cochlear implant evaluations and programming. She works with all three cochlear implant companies: Advanced Bionics, Med-El Corporation, and Cochlear Americas. Dr. Gavin enjoys working with patients of all ages with specific interest in diagnosing and treating hearing loss in adult populations. 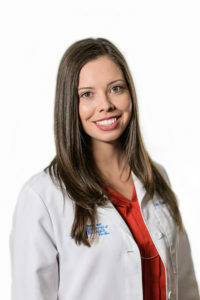 She is a licensed audiologist in the state of Florida and is also a fellow of the American Academy of Audiology (F-AAA).